Symbol and Metaphor In Christine Eyres' Paintings. 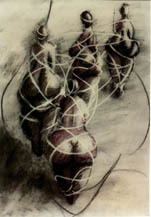 Symbol and Metaphor Inform Christine Eyres' Artwork. The use of symbol and metaphor are significant in Christine Eyres' art practice. Bound to her Scottish forebears, she finds the women in her past lives are strong. They link through the generations of poverty and deprivation with a strength of will and purpose, which reaches across generations and huge oceans of migration. 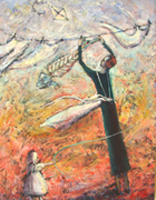 The fish symbol – one of nourishment, creativity and of the feminine - the fish entangled in nets and bound to families through a central force, which is used to entrap them - individuals caught in a web of interlacing ties that bind and enthrall. Trained in Western Australia as an artist and art teacher, Christine has lived in Cairns, North Queensland for the last ten years. In demand to teach adult art classes, Christine is also a writer and print-maker as well as a regularly exhibiting painter. Scotland, with its large population and small land area has become used to its people migrating to Australia, Africa and USA. The boat becomes a metaphor for journeying to far places. So it is that Christine Eyres, in her studio in Cairns, North Queensland, explores the mother/daughter relationship through the examination of her forebears - the women who have strugged and overcome hardships to emerge triumphant and proud, heads held high. 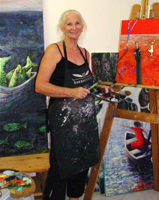 Christine has been painting and drawing for over twenty years and has a strong interest in colour. She works in layers - of both oil paint and meaning - resulting in paintings that entice, engage and inform.